View of “Dio Horia in Mykonos,” 2015. The exhibition “Dio Horia in Mykonos” marks the launch of a platform for reviving the Greek island of Mykonos—famed for its Kardashian-grade holiday scene—as a summer salon. Curated by Dio Horia founder Marina Vranopoulou, this inaugural exhibition brings together a vast number of works by international and Greek artists, across two floors. These include Honza Zamojski’s Father God, 2014, a large spectacle-wearing stone placed atop an elegant blue column; Aleksandar Todorovic’s Iconostasis of Communism, 2008, in which the history of Marxism is told in the language of Eastern Orthodox iconography with watercolor, ink, and acrylic on paper; and a duo of ceramic figures by Dionisis Kavallieratos that includes a coy Death holding down his robe like it’s Marilyn’s skirt and Margaret Thatcher holding a scythe, standing beside Death like Sancho Panza. 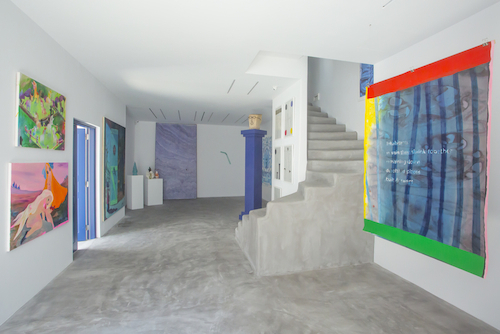 Many works were commissioned for the site: Atelier Arizona’s elegant brass appendage attached to the outside wall of the building, Untitled (“Stairway to Heaven”): An Architectural Landmark, 2015, takes its design from the windmills of Mykonos, while Selma Parlour’s blue color study Dio, 2015, was inspired by the particular light of the Aegean that Henry Miller once described as pure illumination. There is indeed an unexpected weightlessness to the show that does not detract from the context at hand: the Greek crisis. But rather than cast shadows, the exhibition sheds light on an alternative view. Take Elias Kafouros’s hyperrealistic acrylic-on-wood compositions, in which aspects of contemporary life—such as a man with binoculars, a street stall with newspapers, statues of the Olympian gods, and wire fences—are used to compose mandalas. Form follows chaos.